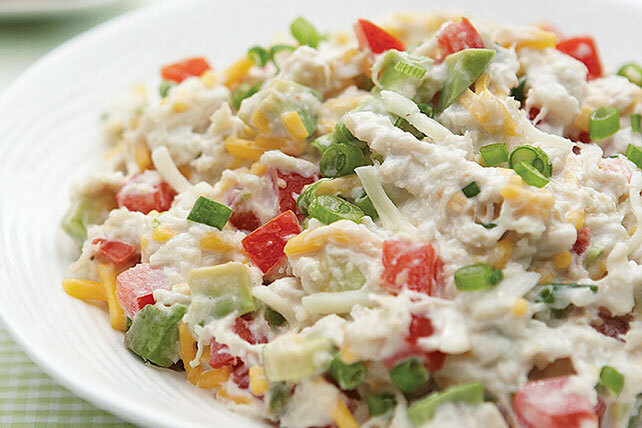 Canned crab is a terrific item to have on hand, especially when it can be turned into a fantastic appetizer like this in a snap. It looks and tastes gourmet, but takes literally seconds to put together. It will likely be eaten just as quickly! Mix crabmeat, cheese and mayo in medium bowl until well blended. Add avocados, tomatoes and onions; mix lightly. Cover. Refrigerate at least 1 hour before serving. Serve with RITZ Crackers. Sprinkle with 2 Tbsp. chopped cilantro just before serving. To ripen, place in paper bag and let stand at room temperature until desired softness. Ripe avocados can be stored in the refrigerator for several days. The flesh of a cut avocado will turn brown quickly, so cut just before using for best results. Or, brush the cut sides with lemon juice to help minimize the browning.